The dingo is a primitive canid related to wolves. It was not part of the ancestral fauna of Australia. Though its origins are not clear, it is thought to have arrived in Australia 3,500-4,000 years ago. 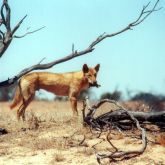 The dingo is the largest mammalian carnivore remaining in mainland Australia, and fills an important ecological niche. It has been regarded as a serious predator of domestic stock since early European settlement in Australia. The dingo is a restricted invasive animal under the Biosecurity Act 2014. Primitive canid related to wolves, up to 60cm tall, weight up to 25kg. Coat is usually red, ginger or sandy yellow, though can also be pure white, black and tan, or solid black. Teeth are larger than those of domestic dogs. Uses roads, creeks and fence lines as travel corridors. More active in autumn (mating season). Frequents more inaccessible areas during whelping and pup-rearing seasons (winter and spring). 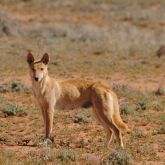 In far western area, most dingoes are purebred. 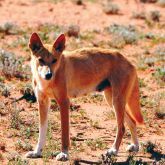 Near settled areas, greater number of dingoes are crossed with feral domestic dogs. Breeds once a year (usually April-June). Usually 4-6 pups per litter. Eats small remnant populations of native species, such as bridled nailtail wallabies, koalas and tree kangaroos, threatening biodiversity. Causes stock losses and lower production from bitten stock. Bitten stock return lower prices than normal stock. Creates risk of disease spreading to domestic animals (e.g. hydatidosis, neospora). Can spread hydatids and other exotic diseases that can affect human beings (e.g. rabies). Can attack children in settled areas, particularly if public contributes to habituation and socialisation of dingoes. Can be nuisance to householders and tourists. Attacks and eats pets in urban fringe areas. Effective dingo control requires an integrated, collaborative approach. This can be achieved using a national approach, where control methods are applied across all tenures by all stakeholders at a landscape (rather than property) level, in a cooperative, coordinated manner. Different control methods, including shooting, poisoning, trapping and fencing, combined with land management practices, are most effective. Can be controlled outside national parks and other protected areas. Visit pest animal control methods for more information. Dingo is a restricted invasive animal under the Biosecurity Act 2014. It must not be moved, kept, fed, given away, sold, or released into the environment without a permit. At a local level, each local government must have a biosecurity plan that covers invasive plants and animals in its area. This plan may include actions to be taken on certain species. Some of these actions may be required under local laws. Contact your local government for more information. The dingo is defined as both 'wildlife' and 'native wildlife' under the Nature Conservation Act 1992, and is a natural resource within protected areas such as national parks. Under the Nature Conservation Act 1992, protected areas have prescribed management principles, which refer to protecting and conserving the natural resource and the natural condition.